MYTH: Independence for the Republic of Latvia was a serendipitous result of historic circumstances. Latvia would not have declared independence if Germany and Russia had not lost World War I and had not had revolutions, if civil war had not broken out in Russia, and if the Entente had not declared the right of nations to self-determination. The idea of Latvian independence did not just appear on 18 November 1918 or even 17 November, but much earlier. Indeed, the idea of an independent Latvia was not widespread among the inhabitants of Latvia (ethnic Latvians included) until 1917, but the situation began to change dramatically in the summer of 1917. After a series of events, including the fall of Riga to the Germans in September, the Bolshevik revolution in November, and the dissolution of the Russian Constituent Assembly in January 1918, the idea of Latvian independence was supported by a majority of Latvian political parties and social organizations. It is for good reason that contemporaries and historians alike believe that Latvia’s independence was declared before 18 November 1918, as indicated by resolutions adopted by the Latvian Provisional National Council on 2 December 1917 and 30 January 1918. In addition, Britain recognized the Provisional Council as the de facto government of Latvia a week before 18 November 1918. Therefore, the declaration of independence was not serendipity and would have occurred at the first opportunity. Latvian independence was declared on 18 November 1918 by 38 lesser-known Latvian politicians, who represented eight insignificant and unpopular parties. Moreover, the most significant political power holder, Latvian Social Democracy (Bolsheviks), did not participate in or support the proclamation of the Republic of Latvia. The majority of the eight political parties that made up the People’s Council of Latvia formed to declare an independent state was, in fact, small in number with little support in society. Yet the same could not be said about the Latvian Farmers’ Union (LZS) or the Latvian Social Democratic Workers’ Party (LSDSP). LZS had participated in all the most important 1917 Latvian territorial elections, obtaining 20–25% voter support. LSDSP, which had separated from the Bolshevik-controlled Latvian Social Democracy in the spring of 1918, had undeniable support among Latvian workers. This was witnessed, for example, by the party’s victory, under very difficult circumstances, in Liepāja City Council elections in January 1919. The party was well organized and had 2-3 times more party members than did the Bolsheviks at the time of declaration of independence. In addition, after the end of the War for Independence (1918–1920), LSDSP won all parliamentary elections. Moreover, there were many well-known politicians amongst those present at the declaration of independence, including LSDSP Central Committee chair Pauls Kalniņš, LZS leader Kārlis Ulmanis, former Russian Duma member Jānis Zālītis, former Riga mayor Gustavs Zemgals, Jānis Akuraters, Atis Ķeniņš, Miķelis Valters, and Fricis Menders. The declaration of Latvian independence on 18 November 1918 took place so quietly that there was no celebration in the city, and the majority of people had no idea that an important historic event had occurred that day. Inhabitants were indifferent to the news of the declaration of independence and some even received it with hostility. The ceremony on 18 November was comparatively ambitious, considering the post-war situation in Riga, where the German occupiers were still in power. The organizers prepared 1200 invitations, which were divided equally between the representatives of the various political powers. Those who were present stated that the Riga Second City Theatre (today – Latvian National Theatre) was over-crowded on 18 November. The theatre was chosen specifically because it could accommodate the large number of people interested in participating. It is known that seating capacity in the theatre was around 800, so the total number present could have been around 1000, which in itself was a significant number, considering the event was planned in a hurry and took place on a Sunday. Guests consisted mostly of members of the intelligentsia, including students, but also many workers – LSDSP received 400 invitations to the event. The 18 November ceremony was described widely and in great detail in the largest Latvian newspapers, including the German press. The press also published the declaration that all power had been transferred to the Latvian People’s Council and that Latvia was now an independent democratic republic. There is no doubt that within days, the vast majority of the residents of Latvia knew of the declaration of independence. There were press reports of celebrations in many schools in Riga. Students at the then Baltic Technical Institute of Higher Education (today – University of Latvia) hung Latvian flags and created an honour guard. In other places in Riga, the national flag was flown as well, creating a notable stir among the people. The declaration did not go unnoticed among people outside Riga as well. For example, a Valmiera general secondary school cancelled the last three classes of the day in honour of the event. Widely publicized events took place in Liepāja, where several thousand people, including many workers, attended an event at St. Anna’s Church. 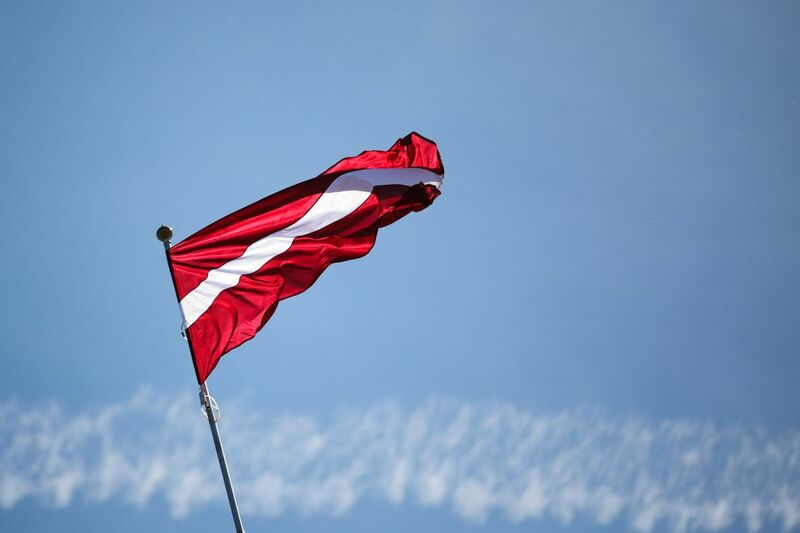 Many national flags were waved by those in attendance, and the Latvian flag was also flown over the Liepāja Latvian Society Hall. The Provisional Government was a German puppet government, Kārlis Ulmanis was of German ancestry, and the Republic of Latvia was a German-inspired project. The Latvian government was funded by the Germans and could only function with the protection of German military forces. At the time of the declaration of independence, Germany had not yet recovered from the recently occurred November revolution and did not have a clear policy regarding the Baltics. The local Baltic Germans attempted to create a Baltic state that would include Latvia and Estonia. The leadership (Regent Council) of this “state” continued to operate until 28 November 1918. The negative attitude of Estonia and Latvia towards the possibility of such a state, as well as the Ententes’ dismissive position, did not allow the Germans to realize their plans for the creation of a Baltic state. True, the newly formed Latvian state did receive some support from some government of “revolutionary” Germany, as well as from some German and Soviet soldiers and sailors. German soldiers were scheduled to be sent back to Germany and were interested in the quick creation of a Latvian state, which would relieve them of the duty of protection of this territory from communist invasion. A week after the declaration of independence, Germany recognized Latvia de facto. Recognition notwithstanding, the German occupying forces placed hurdles in the way of forming the new state. They hesitated in dismantling occupying institutions and handing over state functions to the Ulmanis-led Provisional Government; they also initially refused to arm Latvian military units and continued to delay the process, even after signing the associated treaty. In addition, the actions of the Provisional Government did not indicate that it was a German marionette. Ulmanis’ government attempted to establish close relations with the members of the Entente (Germany’s enemies), regain control of German occupying institutions, and refused to grant land to German soldiers who had fought against the Bolsheviks, even though the Germans persistently attempted to gain such rights. It should also be noted that the People’s Council originally wished to hold the 18 November ceremony in Riga Castle, home to the German 8th Army High Command, in order to raise the flag and symbolically demonstrate Latvia’s victory over the occupying forces. Ultimately, it was decided not to use Riga Castle because the Germans categorically refused to lower their flag, and the space was too small to be able to hold such an auspicious ceremony. If the Latvian Provisional Government was not a German marionette, then it was a British puppet. Great Britain had recognized Latvian independence de facto a week before the formal declaration. Great Britain wished to create a cordon sanitaire between German and Russia and, thus, created the Republic of Latvia. Great Britain was truly interested in limiting the spread of communism, but by the summer of 1919 and the signing of the Treaty of Versailles, their priority was not stopping Soviet Russia but rather putting pressure upon Germany, which could resume military actions at any time. For this reason, Great Britain offered limited assistance to the Provisional Government of Latvia – small deliveries of ammunition and protection of Kārlis Ulmanis’ Cabinet (toppled by the Germans) on 16 April on one of the ships in their fleet off the coast of Liepāja. The British did not rush to establish contacts with the Latvian government and refused to use their war ships to defend Riga against the Red Army in early January 1919. Great Britain and France involved their war ships in actions in Latvia only during the October-November 1919 campaign against the pro-German Bermondt army. The British lost several sailors in these battles. British Foreign Secretary, Arthur Balfour, formally recognized Latvia’s independence on 11 November 1918. Yet, it did not recognize the People’s Council but its precursor – the Latvian Provisional National Council (LPNP) – as the de facto government of Latvia. This was not surprising, as the LPNP had attempted to maintain close ties with British and French diplomats since the end of 1917. In 1918, Great Britain also provided financial aid to the LPNP. Yet, the British-recognized LPNP did not become the government of Latvia, nor did they make up the base of the People’s Council, although a number of LNLP members became Cabinet Ministers. The fact that civil war broke out immediately after the declaration of independence indicates that the Provisional Government, led by Kārlis Ulmanis, did not represent the interests of the majority of society. At one point, there were three concurrent governments in Latvia. This indicates that the local Germans and communists, who were supported by wide segments of society, did not support the creation of the Republic of Latvia. The assertion that Latvia experienced a civil war from 1918 to 1920 is misleading. At the end of 1918, the preconditions for civil war did not exist. Local communists in Latvia were very few – only about 800. In comparison, the Latvian Social Democratic Workers’ Party, which supported the creation of the Republic of Latvia, had approximately 2500 members. The situation changed after the entrance of Russian Red Army, which brought with it thousands of communists (mostly Latvians living in Russia). Latvian communists even admitted that without the help of the Red Army, they would not have been able to engage in armed resistance or wrest power from the Provisional Government. It served Germany and Soviet Russia to portray the events in Latvia as civil war and not foreign aggression. Thus, it was advantageous for both the Germans and also the communists to attempt to create pseudo-permanent state and political structures, which were very unpopular amongst the local people, despite massive financial and military support. The need to hide their aggression was also the reason that neither Germany nor Russia formally declared war on Latvia, even though both countries were forced to sign peace treaties with the Republic of Latvia in 1920. These treaties indicate that both countries were actually at war with Latvia. Formally, the Provisional Government declared a state of war on 11 February 1919, and ceased diplomatic relations with Germany on 25 November 1919. Latvia is one of the rare countries (perhaps the only one) that has fought against both Germany and Russia simultaneously and won.